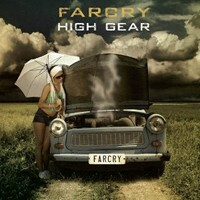 FarCry are hot on the heels of their critically-acclaimed Kivel Records debut “High Gear,” and are poised to make their triumphant New Jersey debut Sunday, April 25, at the KatManDu nightclub. The band has played several high-profile shows around the US , sharing the bill with such rock icons as Bret Michaels, Firehouse, Skid Row, April Wine, Dokken, and Enuff Z’Nuff. This event represents more than just an amazing rock show, but also the homecoming of Trenton native Mark Giovi, FarCry front man, and a vocalist with a prolific list of accomplishments to his name. Although he has performed around the world in a variety of capacities, Giovi still admits, “there is no place like home.” Currently living in Las Vegas , Giovi is the featured singer in the nightly hit show “Bite,” and is also one of the founding members of the Las Vegas Tenors. Joining Giovi is guitarist extraordinaire Pete Fry. Both musicians had coincidentally played together in the burgeoning Trenton hard rock scene of the 80s and 90s, and were miraculously reunited by producer John Kivel in the interest of forming a rock and roll super group, which became FarCry. Opening band’s Harmzway is also celebrating an exultant reunion after a 15-year hiatus, reigning as a hardworking regional band in the late 80s and early 90s. Members Carmen “Doug” Bitonti (Vocals/Bass), Damon Duchai (guitars), and Joe Suarez (drums) plan to hit the ground running and prove that time has not diminished their edge in the slightest. Kicking the night off with a special acoustic set is Goodbye Thrill. KatManDu is located at Route 29 – 50 Riverview Executive Park – Mercer County Waterfront Park, Trenton , NJ 08611 (609) 393-7300. Doors at 7:30 p.m., tickets are $10.00 and all 21+ are welcome.